Box art for the Sega Saturn version of the game. Doom was a first-person-shooter developed by id Software in 1993. The game helped pioneer the concept of fps in video games, and stands as one of the most important video games of all time. With that, Doom would receive several console ports throughout the years, with some that were successful while others weren't. A Sega Saturn port was developed by Rage Software and released by GT Interactive in the U.S. on March 26, 1997, much later than the competition, and even then, it is believed to have been rushed in development. A port of the PlayStation version with several features omitted and abysmal framerate, averaging at 13 frames per second, The Sega Saturn port of Doom is highly regarded as one of the worst ports of a game ever released, if not the most disappointing of them all. Rumors were spread for many years that the Japanese release of Doom on Sega Saturn runs smoother than the North American release, however, in recent years, John Lineman of Digital Foundry debunked these rumors, with both NTSC-U and NTSC-J versions’ being virtually the same, framerate-wise. The Sega Saturn port was originally meant to be an entirely unique project, unrelated to the PlayStation and Jaguar ports of Doom, the latter of which being the foundation for most of the console ports at the time, including the PlayStation version. Rage Software’s original goal was to port the original PC release of Doom and Doom II, with the levels of both games intact and without any changes related to hardware restrictions. 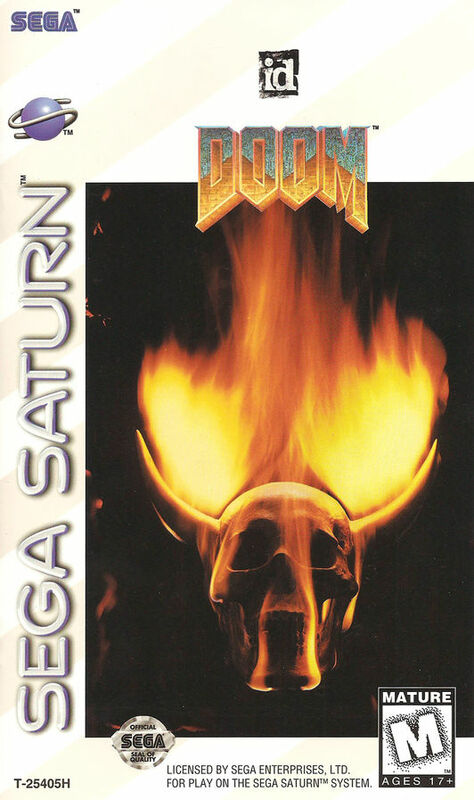 The lead programmer of the Saturn port of Doom, Jim Bagley, wrote a custom engine based on Doom’s idTech1 game engine which made full use of the Sega Saturn’s hardware. Despite the console being known for not handling 3D graphics as well as the PlayStation or the Nintendo 64, this custom engine was meant to be hardware-accelerated, making use of the Saturn’s graphics chips: the VDP1 for sprites and walls, and the VDP2 for background graphics. Bagley affirms that the game could run at 60FPS, a very rare feat in 3D Saturn games, let alone first-person shooters, and it could run at fullscreen on stock Saturn hardware. The prototype was sent to id Software for approval. Even with the feats achieved by Jim Bagley, id founder John Carmack was unsatisfied with the prototype, telling Bagley to re-write the entire code to run in software mode, therefore using solely the CPU to run the game, to prevent affine texture warping, a quirk from 32-bit consoles like the Saturn and the PlayStation which Carmack hated. Due to time constraints, the idea of Rage Software porting the original PC release’s maps onto the Saturn Doom port was scrapped in favor of porting the PlayStation version, instead. The maps on the PlayStation port was derivative from the Atari Jaguar version, were modified to accommodate the console’s restrictions. However, the Saturn’s architecture was too complex to do a competent port of PlayStation Doom in a short period of time, thus the final product being shipped with the low framerate. Several features of the PlayStation port of Doom were removed for the Sega Saturn port such as colored lighting, reverberation, and in the case of the NTSC release, deathmatch and co-op multiplayer. The PAL release received the removed game modes, however. Though some footage of beta versions of the Sega Saturn port of Doom can be seen online, nothing related to Jim Bagley’s prototype has surfaced. In 2016 on the DoomWorld forums, Bagley himself confirmed that he no longer owns the source code of the prototype nor the Saturn development kit which he used to program the game. It is unlikely that the prototype is saved at id Software’s archives, either. Despite his distaste for affine textures, John Carmack later admitted that he should’ve allowed more experiments with the Saturn hardware, in retrospect.